A newspaper clipping from The Cincinnati Herald on Sept. 14, 1963, included a picture of Jack Hansan and other members of the Cincinnati delegation. 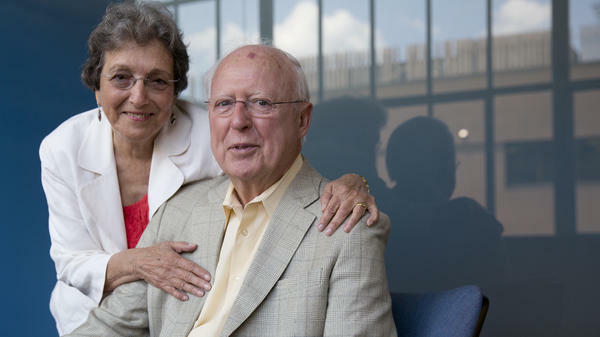 Jack Hansan and his wife, Ethel, live in Northern Virginia. They are both still moved to tears when they recall the March on Washington in 1963. Hansan sent his wife and four sons a postcard on the day of the march. Back in Ohio, his wife says she was "living it vicariously" via the television broadcast. 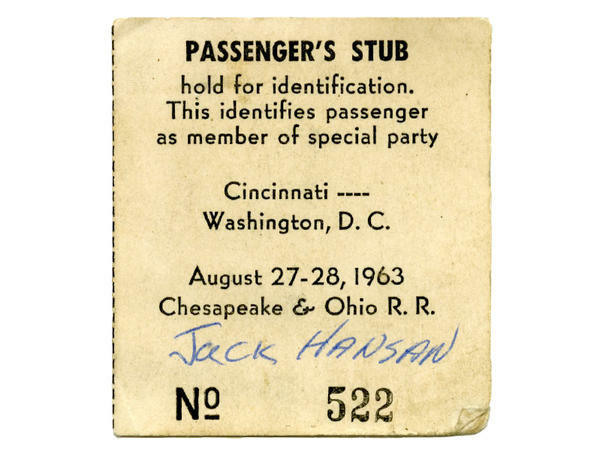 Hansan rode a chartered train to the capital with 500 other members of the Cincinnati Committee for the March On Washington. Fifty years later, he still has his ticket stub. Throughout 1963, American TV screens had been filled with images of non-violent demonstrations that turned ugly, with Southern police officers unleashing dogs and fire hoses on protesters. There were broad concerns all the way up to the top levels of government about the March on Washington. How large would the crowd be? Might there be violence? But Jack Hansan of Cincinnati was not concerned about all that. A white man who'd been working on civil rights in Ohio, he wanted to be in that number, however large or small the gathering. "We had to get rid of this — I don't know how you would say it — this discrimination that was so prevalent in communities like our education system, our churches," Hansan says. "So participating in the march was like climbing a mountain, and for us, we wanted to be on the top." That did not sit well with Jack Hansan's father. He wrote a letter pleading for his son to stay put. "He lived in Kansas City, Mo., and his message was, 'I wish you wouldn't go,' " Hansan explains. "And he said, 'Your real responsibility is to your family, your sons.' But you know, that was him." Hansan was one of 500 Cincinnati businessmen and civic activists who took a special train to D.C., leaving Cincinnati at 5 p.m. "We rode two nights on a train, one up and one back. There was no club car, but it was fun," he laughs. The group spent the night talking and schmoozing. "We were all dressed politely, like we were going to an office — shirts and ties." That attire was no accident. Marchers were advised by the local organizing committee to look clean and sharp, dressed as if they were in D.C. to close a deal. Once they got to the city, Hansan says he had never seen a crowd that large and integrated. "I do remember the songs and listening to the entertainers ... I remember Peter, Paul And Mary," he laughs. "I remember the songs more than I do the speeches." Even so, Hansan knew he was witnessing history that day and wanted to tell his wife and four young sons about it. 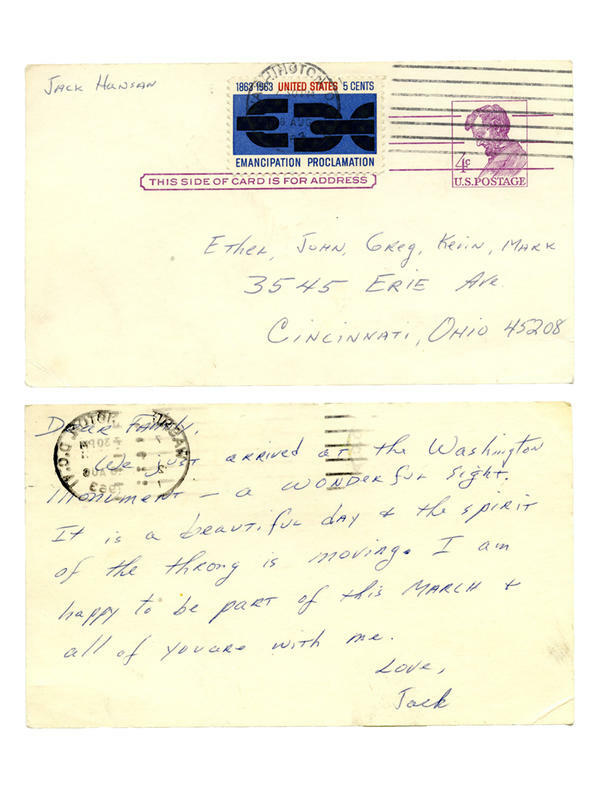 He grabbed a plain postcard, stamped with a Lincoln 4-cent stamp, and jotted down a few words. Hansan, who still has the postcard, chokes up as he reads his note aloud. As Hansan reads, his wife, Ethel, looks on and weeps. Her husband's trip — and the uncertainty over what might happen at the march — was very stressful, she says. "Just listening to him talk about it, it did bring me to tears remembering back on what it felt to be left back with the little ones and not really knowing what was happening there. "Fortunately, we did have a television set and they were broadcasting it, so I was kind of living it vicariously," she continues. "But the little kids were ignored and not properly taken care of most of the day, because I sat in front of the television watching it with a great deal of trepidation." Rev. King's speech was very moving, Ethel Hansan says. And even today, she cries when she hears the song, "We Shall Overcome." "That was very moving for me, when they were all holding hands, and they were singing." Ethel and Jack Hansan, who now live in Northern Virginia, are proud of their memories. He's Catholic and she's Jewish, and the pair has spent a lifetime working on building bridges of all kinds. They've kept a treasure trove of mementos from the march. When asked to share their own six-word stories on race relations in America today, Jack Hansan says, "We all need to keep trying." "That's it," he says. "You know, it's not been done. And the March on Washington was just one of the starting events, but it's still not complete." Ethel had a harder time settling on just six words. "But what I would like to impart to people who are persecuted is to rise above it," she says. "You know, don't let it drag you down. "Because I think that's the tendency, when you have all that negative stuff thrown at you, that you tend to believe it," she says. "Don't believe it. You're better than that ... You're better than that and you know it. You should know it." You can find more of Jack Hansan's memories and mementos from the March on Washington at The Social Welfare History Project, a website he founded to educate the public about the history of social welfare in America. Throughout August, MORNING EDITION and the Race Card Project will be looking back at a seminal moment in civil rights history. The March on Washington for Jobs and Freedom took place 50 years ago this month. About 250,000 people came to the nation's capital from all over the country, in the biggest demonstration Washington, D.C. had ever seen. It was at this event on August 28th, 1963 that Dr. Martin Luther King, Jr. delivered his landmark "I Have a Dream" speech standing before the Lincoln Memorial. WERTHEIMER: This month, we'll meet some of the people who participated in that historic event. We'll hear their memories and get their thoughts on race relations in America today through the Race Card Project's signature six-word stories. NPR's Michele Norris is curator of the Race Card Project. Today, she introduces us to 81-year-old Jack Hansan, a former civic activist and retired social worker from Cincinnati. MICHELE NORRIS, BYLINE: Before we hear more about Jack Hansan's story, first, a little background. Throughout 1963, American TV screens had been filled with images of non-violent demonstrations that turned ugly, footage that showed southern police officers unleashing dogs and fire hoses on protesters. NORRIS: There were broad concerns, all the way up to the top levels of government, about the march. How large would the crowd be? Might there be violence? Jack Hansan of Cincinnati was not concerned about all that. He was a white man who'd been working on civil rights in Ohio, and however large or small the gathering, he wanted to be in that number. He explained why when he visited our studios. JACK HANSAN: We had to get rid of this - I don't know how you'd say it - this discrimination that was so prevalent in communities like our educational system, our churches. So, participating in the march was like climbing a mountain, and for us, we wanted to be on the top. NORRIS: That did not sit well with Jack Hansan's father. He wrote a letter pleading for his son to stay put. HANSAN: You know, he lived in Kansas City, Missouri, and his message was, you know, I wish you wouldn't go. And he said your real responsibility is to your family, your sons. But, you know, that's just - that was him. NORRIS: How did you respond to that? HANSAN: I saved the letter. NORRIS: Hansan was one of 500 Cincinnati businessmen and civic activists who took a special train to D.C. 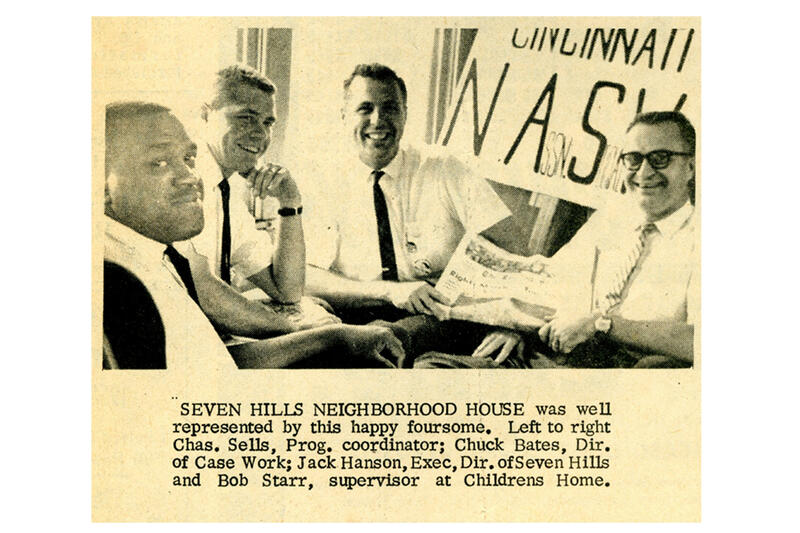 They left Cincinnati at five in the evening. HANSAN: We rode two nights on a train, one up and one back. There was no club car. It was - but it was fun. HANSAN: No, not singing, but talking and schmoozing. We were all dressed politely, like we were going to an office, shirts and ties. NORRIS: That attire was no coincidence. Marchers were advised by the local organizing committee to look clean and sharp, dressed as if they were in D.C. to close a deal. Once they got to the city, Hansan had never seen a crowd that big and that integrated. HANSAN: I do remember the songs and listening to the entertainers. I know this sounds - I remember Peter, Paul and Mary. And I remember the songs more than I do the speeches. NORRIS: Even so, Hansan knew he was witnessing history, and he wanted to tell his wife and four young sons about it. He grabbed a postcard and jotted down a few words. HANSAN: I was, in effect, telling them not to worry. It was a huge success. NORRIS: Do you mind reading what you wrote to them? HANSAN: I saw it. Oh, yeah. Here it is. NORRIS: And it's a plain, white postcard, yes? HANSAN: Yes, with a Lincoln stamp on it, U.S. postage. I said: (Reading) Dear family, we just arrived at Washington Monument, a wonderful sight. It is a beautiful day, and the spirit of the throng is moving. I am happy to be part of this march, and all of you are with me. NORRIS: Jack Hansan was not the only person choking up when he recalled that story in our studio. On the other side of the glass, in the control room, his wife, Ethel, watched and wept. ETHEL HANSAN: It was very stressful. And just listening to him talk about it, it did bring me to tears remembering back on what it felt to be left back with the little ones and not really knowing what was happening there. And fortunately, we did have a television set, and they were broadcasting it. So I was kind of living it vicariously. But the little kids were ignored and not properly taken care of most of the day, because I sat in front of the television watching it with a great deal of trepidation. NORRIS: Those fears eventually faded away. Mrs. Hansan, do you remember Dr. King's speech? HANSAN: I do, very much so, yeah. It was moving. And I loved "We Shall Overcome." Oh, my God. I still cry when I hear it. That was very moving for me, when they were all holding hands and they were singing "We Shall Overcome." NORRIS: Ethel and Jack Hansan are proud of their memories. He's Catholic. She's Jewish, and they've spent a lifetime working on building bridges of all kinds. They now live in Northern Virginia, and they've kept a treasure trove of mementos from the march: programs, tickets, news clippings, song lists. You can find a sampling at our website. We asked the Hansans about their thoughts on race relations in America today, their six-word stories. First, Jack Hansan. HANSAN: We all need to keep trying. That's it. You know, it's not been done. And the March on Washington was just one of the starting events, but it's still not complete. NORRIS: Ethel had a harder time settling on just six words. HANSAN: I don't know if I could put it in six words, but what I would like to impart to people who are persecuted is to rise above it. You know, don't let it drag you down. NORRIS: I think I heard six words in there: don't let it drag you down. HANSAN: OK? Because I think that's the tendency, when you have all that negative stuff thrown at you, that you tend to believe it. Don't believe it. You're better than that. HANSAN: And you know it. You should know it. WERTHEIMER: That was Ethel Hansan and her husband Jack, speaking with Michele Norris about their memories of the March on Washington. And, again, you can find more about their story at npr.org. Transcript provided by NPR, Copyright NPR.